Lately, I’ve been branching out from specialty e-cigarettes into some of the more mainstream players in the electronic cigarette Industry. 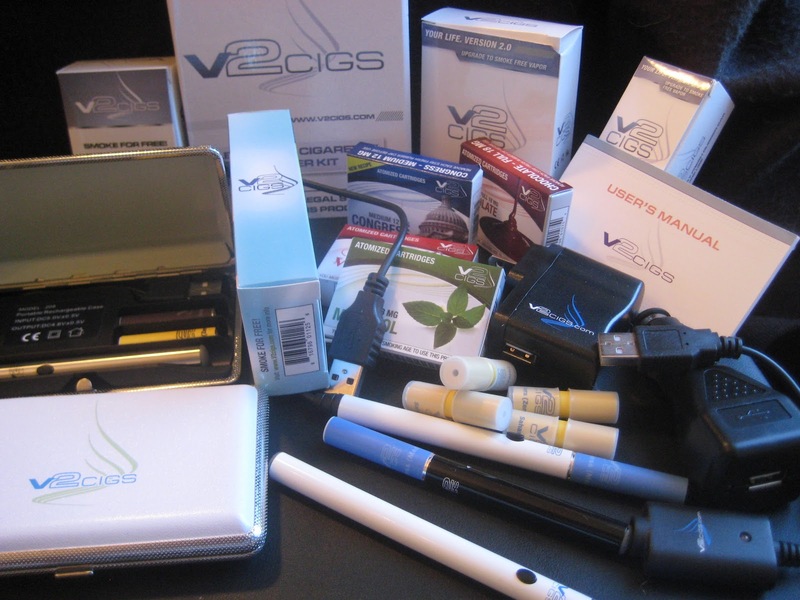 V2 Cigs is one of the biggest brands on the market. The company has been bragging lately they are the most popular e-cigarette retail site on the web (according to Alexa rankings). Since a lot of people have likely heard all kinds of information about this company, I wanted to do an in-depth and unbiased V2 Cigs review and put the gear through its paces. As you may be guessing, this kit is fairly pricey, weighing in at $159.95, but you can get a 10% discout with code “stevevape”. If you don’t want to go quite all-in with V2 Cigs, they do have more standard kits at more standard prices. The appropriately named Standard Kit offers 2 batteries, 10 cartomizers, the USB, AC and Car adapters for about half the price. You can also pick up a basic kit with the USB pass-through and some cartos. Since there are quite a few parts to the Ultimate Kit, I’m going to deviate a little bit in the organization department for the V2 Cigs Review and break out some of the compenents separately to talk about them in more detail. The V2 Cigs lineup is based on the KR808D-1 standard. This is a fairly popular standard for this type of starter kit. 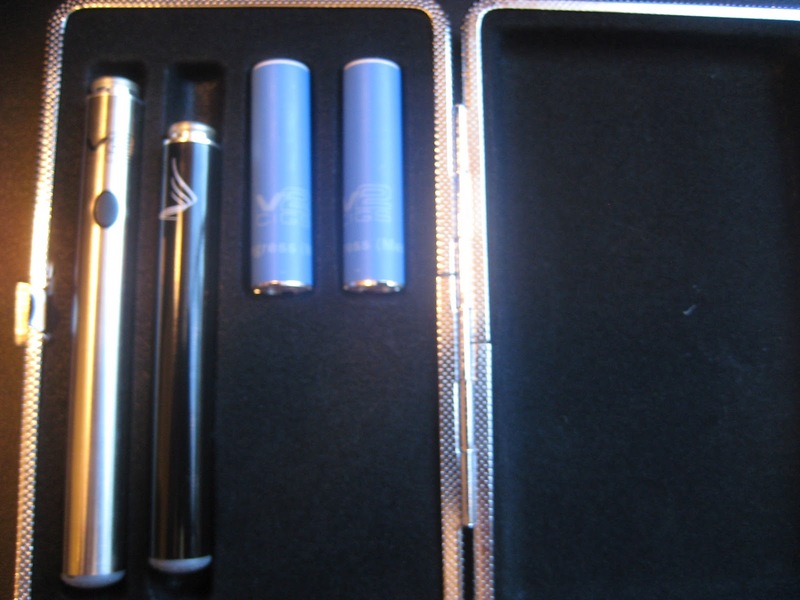 I have reviewed several kits using this standard including Revolution Vapor and Smokeless Image’s kits. I have to admit, as far as small battery e-cigarettes go, the 808 is fast becoming my favorite. 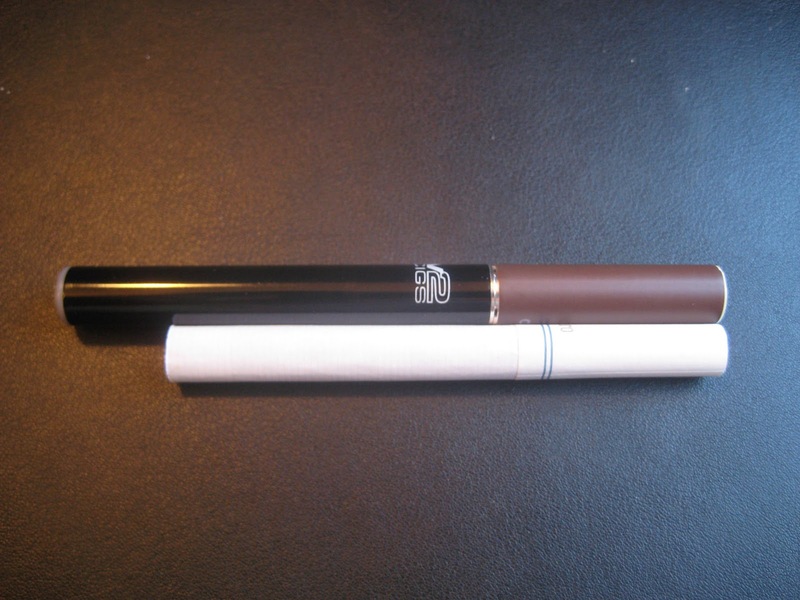 The overall size of this e-cigarette is slightly fatter than a typical cigarette and slightly to considerably longer than a typical smoke. V2 Cigs provide a decent balance between a smaller size, battery life and performance. Because this kit is based on a standard, you are free to experiment with other hardware like clearomizers using your existing e-cigarette. 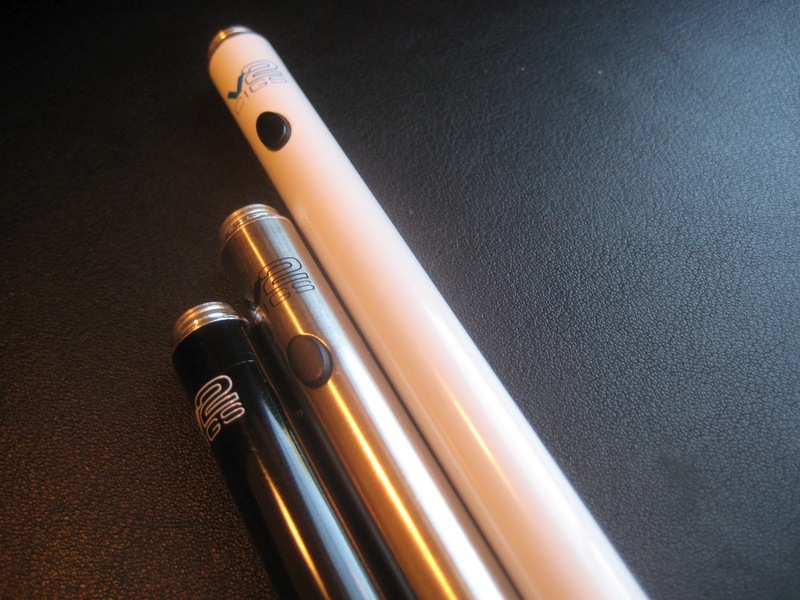 As is the case with increasingly more of the large vendors, these e-cigarettes use a two piece design. The e-cigarette consists of a battery attached to a cartomizer, which is an atomizer that also houses the e-liquid in a single, disposable body. 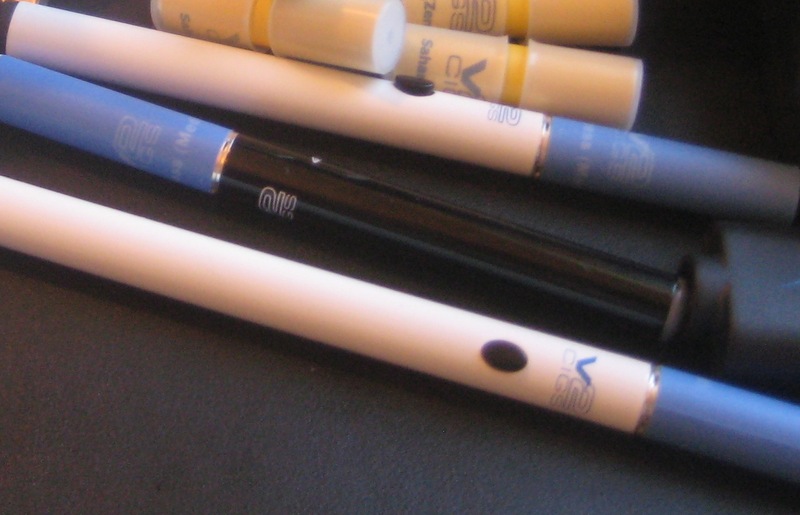 You can read more about cartomizers in the e-cig 101 series. 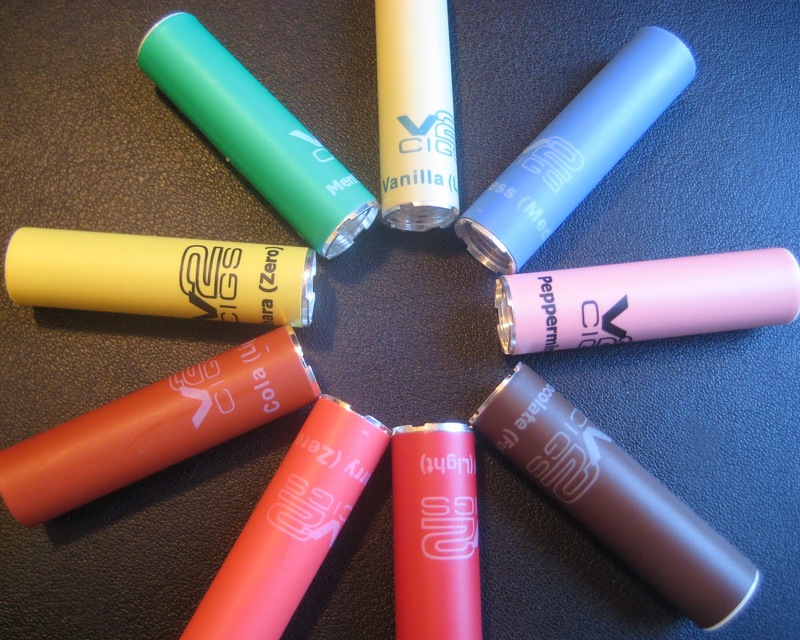 V2 Cigs batteries come in a few different varieties and color options so you can fully customize your experience. Batteries are offered in 4 different colors, black, white, silver and blue. LEDs will vary depending on the color of your battery, but come in red, white or blue. All models of batteries come in either manual or automatic and your choice of 3 different sizes. You may also like: Maxi Roughstack v2 Review - Rugged classic or outdated relic? Normally, I am staunchly in the manual battery camp. I feel that you can get better performance out of manual batteries because you can pre-heat the coils before you take your puff. However, with the V2 line, I’m actually leaning towards the auto batteries. There are two reasons for my preference. First, the auto batteries do work quite well, they activate at a very natural level when taking a drag, you don’t feel like you have to fight it to get it to activate, nor do you feel like it will fire if you look at it funny. The e-cigarette in general is responsive enough that I also don’t feel like I have to spend a lot of time pre-heating the coils to get a nice, warm vape. The second reason, unfortunately, is that the manual battery offerings aren’t my favorite. While the activation switches are a good size and raised so they are easy to find, I simply don’t like the way they feel. The switches are a hard plastic, that feels a little bit cheap to be blunt. I also think that the switches aren’t very responsive, one of my batteries I have to mash down quite a bit to get the thing to turn on. The other battery (the XL) is a little more responsive, but still requires a bit of manhandling. Other than the button, also noteworthy with V2 Cigs’ battery offerings is that there are three (rather than 2 found with most companies) different lengths. There is of course the standard length battery offering 220mAh of capacity, the XL version which is closer in length to a pen with the cartomizer attached and offers an impressive 320 mAh of storage for many hours of use. The third option is not at all common and that is the “shorty” battery. This battery is 100mm in length with the cartomizer attached. The shorty’s closeness in size to a traditional cigarette may be particularly attractive to those trying to convert to e-cigarettes. Naturally, the mAh rating has to drop since the battery is smaller, and shorty weighs in at just 150mAh. I was able to get almost 2 hours of fairly constant use out of the battery, that’s not too shabby. The USB Pass-through, branded as the Power Cig (also available as a smaller “notebook cig”) is an interesting device, worthy of its own section. 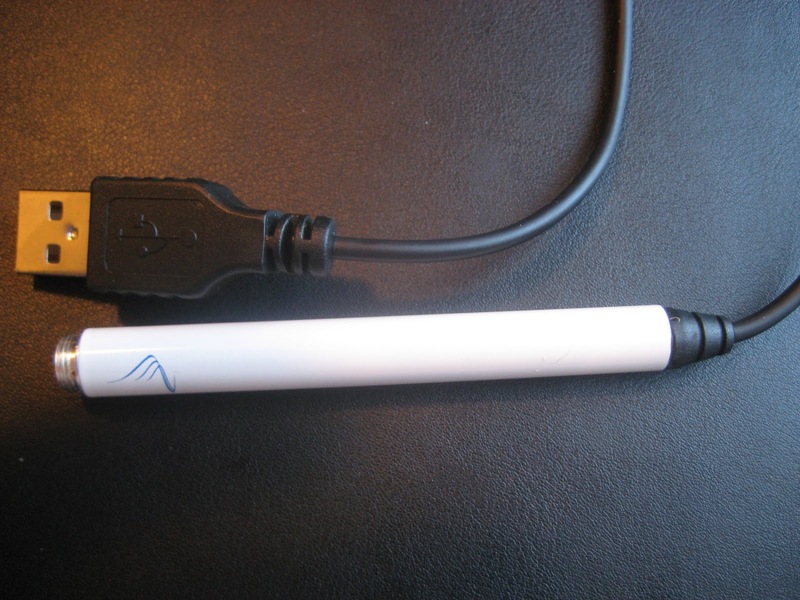 USB pass-throughs are fairly common accessories in the e-cigarette world. The V2 Power Cig has a couple of features that set it apart from other USB devices I’ve used before. First V2’s USB e-cigarette is high voltage. The device runs at 5.1v which is higher than the voltage output by the regular batteries. This results in warmer vapor and more of it! If you’re a fan of high vapor production, the Power Cig has you covered. The other thing about this device is the overall build quality. I’m mostly familiar with 510 style pass throughs, which have a thin wire sticking out of the end of the device that feels flimsy and is indeed prone to breakage. The V2 offering has a nice boot protecting the wire at the end of the e-cigarette along with a very flexible and thicker wire. 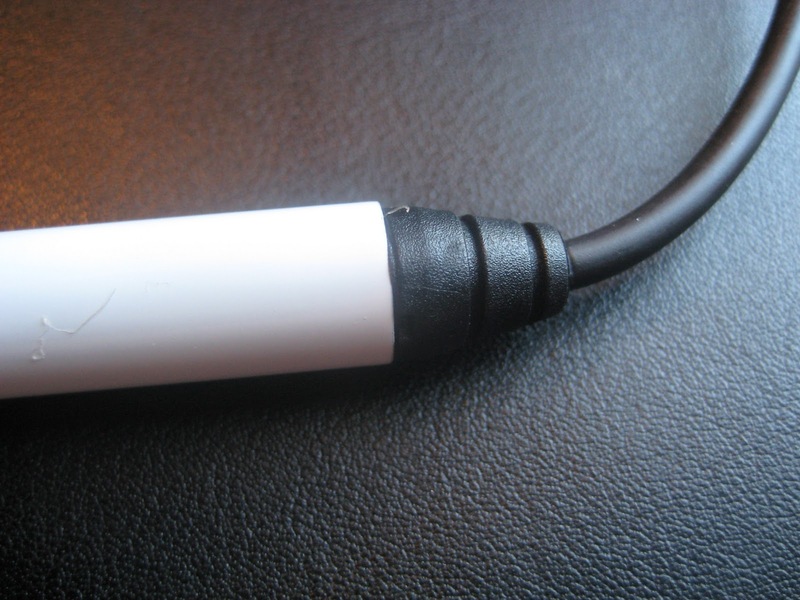 The coating on the wire is a rubberized and part of the cable closest to the USB connector is curled like a telephone cord to minimize tangling. To be honest when I saw the Ultimate Kit came with a USB pass-through, I wasn’t expecting a lot, but I am impressed with this device, despite its only being offered with the manual button of which I’m not generally a big fan. The ultimate kit comes with not one, but two, cases. Both cases look identical and are hard cases that flip open. 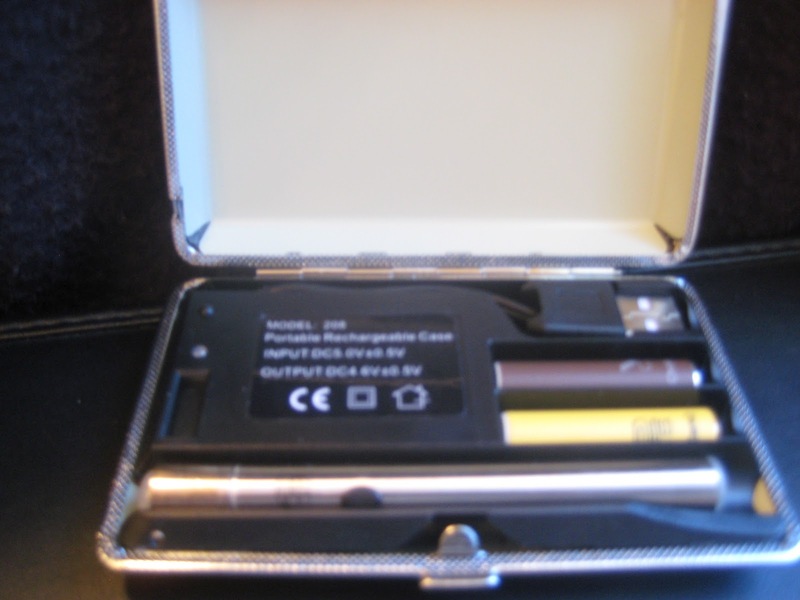 The first case simply has a felt lining with moulded indentations for two batteries and two cartomizers. The second case is the charging case which allows you to charge up your batteries on the go. The charging case has spots for one battery (short or standard) and two cartomizers. There’s a built-in USB cable used to charge the case’s internal battery, which in turn charges your e-cigarette batteries. Both auto and manual batteries work with the case. The case features a small activation button and an LCD readout showing the case’s battery level. The case is rated for about 3-4 charges, which I found to be accurate. 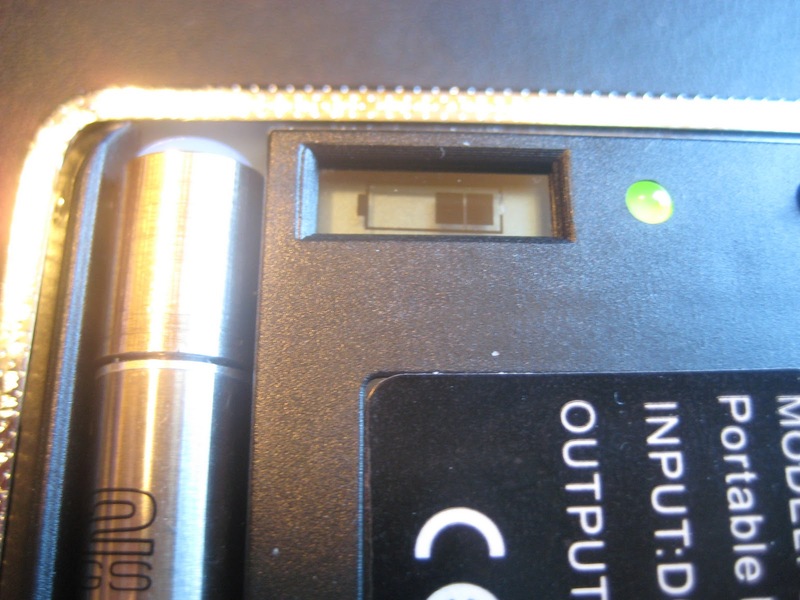 The process to charge the batteries involves screwing the battery onto the connector and then pressing the little button next to the display screen until the light blinks. Unfortunately after that, all the lights turn out, so there’s no indication as to when your battery is done charging. V2 refers to their cartomizers as cartridge and offers them in a variety of flavors and nicotine levels from 0mg to 18mg. There are 10 flavor choices ranging from a few different tobaccos and menthol to other flavors like cherry, vanilla and cola. Each cartomizer is colored based on its flavor, a nice touch, but peppermint cartridges are pink, which mentally, tricks me into thinking “Pepto-Bismol”. Cartomizers rarely last as long as the sellers claim. V2 is guilty of this in claiming their cartridges are the equivalent of one pack of cigarettes. They’re not. Depending on how heavily you use the device, expect each cartridge to last you the equivalent of 5-10 cigarettes. If you’re just starting out, it takes a little time to get used to using the device, so expect your cartridge life to fluctuate until you find your pattern. V2 Cigs doesn’t offer separate refill liquid. The end caps on the cartomizers are hard plastic rather than silicone, so they are slightly harder to remove. Once the end caps are removed, some, but not all cartridges have an inner silicone ring which can be pulled out to expose the filler material. Refilling these cartomizers is a simple matter of dripping e-liquid onto the filler until it is once again saturated. As far as technical details go, the cartomizers weigh in at a fairly typical 2.9Ω. They feature a slightly unusual horizontal bottom coil design. A tube which splits open into a Y shape and is connected to the base of the cartomizer on either side of the heating coil runs the length of the cartomizer which forms the air passage for the vapor to travel. 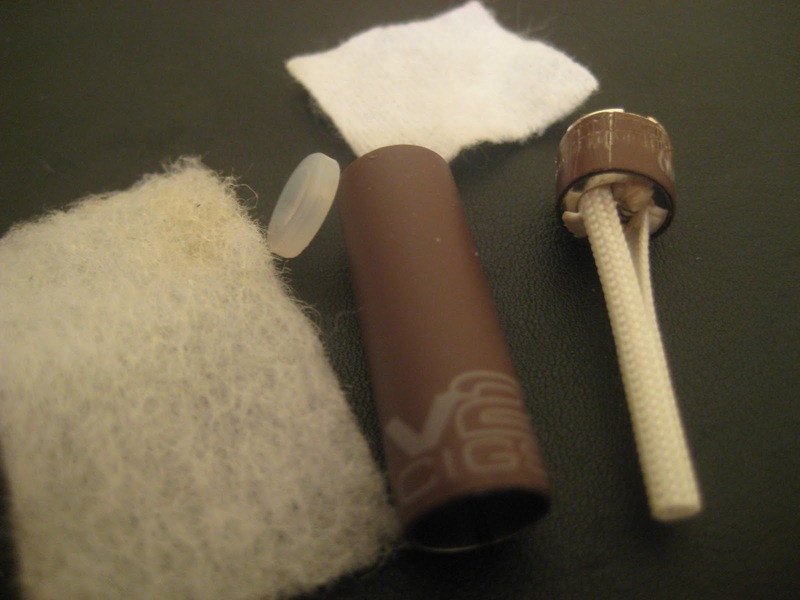 An absorbant material is wrapped several times around the tube and holds the e-liquid. This design seems to work exceptionally well. The V2 is an excellent performer. Vapor production is excellent, and very warm, especially for this type of e-cigarette. Flavor is of course subjective, there were some that I liked a lot (I’m a fan of congress despite not being huge on tobacco flavors), others not so much (can’t get over the Pepto thing). Overall I couldn’t really accuse any of the flavors I sampled of being subdued. Thank you for making it to the end! I hope you found this to be an unbiased V2 Cigs review in a sea of information about a very mass market e-cigarette brand. While there is quite a bit of hyperbole surrounding these kinds of e-cigarettes, I think that V2’s offering is a pretty solid contender despite a few shortcomings. Performance is very respectable, and quite exceptional from their pass-through offering. V2 Cigs also seems to have a couple of unique things to bring to the party like that pass-through and their shorty batteries. If you want to dive headfirst into e-cigarette gear, the V2 Ultimate Kit will get you more goodies than you know what to do with. Of course, if you just want a standard kit, they got you covered too. Don’t forget as a reader of SKVW you get 10% off all purchases at V2Cigs.com with coupon code “stevevape”. Disclosure: The vendor provided the products featured in this V2 Cigs review for review purposes. This site uses affiliate links and banners for V2 Cigs to offset the costs of maintaining this site.